Both players roll a d6 for the starting roll. The player with the higher result can choose to be the first or second player. The second player chooses his table edge. The first player deploys first and takes the first turn. So, you’ve just won the starting roll… now what? The roll of a single die doesn’t determine the winner of any game of Warmachine/Hordes, but the starting roll can certainly set the tone for the game. In this article I’ll describe the relative merits of being the first or second player. I believe model placement is one of the fundamental things that differentiates beginners from more experienced players. This post looks at some of the different factors that impact on the placement of individual models, both as part of a unit and when they move individually. Before I launch into the specifics of placement let’s talk about the anatomy of a model… no, no, not like that! A game plan, eh? It’s hard to predict how any game of Warmachine/Hordes will go, but it’s always worthwhile having a game plan. This plan should be pretty concrete in terms of how your force deploys and how you’d like the first turn will go down. There are some variables, specifically exceptional ranged threats in the opposing force or really awkward/opportunistic terrain, but in general you have the most control over your army in the first turn of the game. 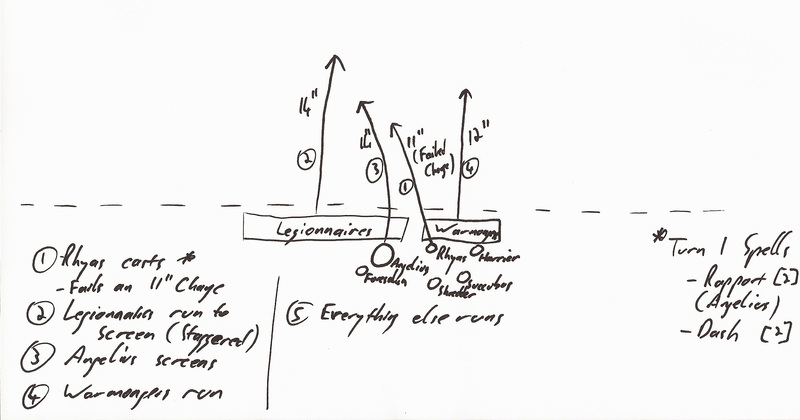 Here’s the kind of scribble I produce for most of my armies. You may also have a plan for what components of your army are best suited to deal with what types of threats and you may have idea for how you think your army may win the game. For now I’ll concentrate on Deployment and Turn 1. Last time out I talked about some of the basics of getting prepared for a Steamroller event. Knowing the SR2013 scenarios is one of the fundamentals. Today I talk about two of them – Incursion and Close Quarters. There are twelve different scenarios in Steamroller 2013 and getting to grips with them can be pretty daunting for a new tournament player. We have a tournament for newer players coming up in Dublin in the next few weeks and I thought I’d run through the scenarios the players are going to see there as they’re some of the more popular ones you’ll encounter. Ciaran, the Event Organiser (EO), was kind enough to roll up these scenarios in advance. One of the guys on the Warmachine/Hordes Ireland Facebook group asked for a post introducing newer players to the Steamroller format and playing competitively. I’m not the most qualified to write this, but I have played in one or two tournaments… Here I concentrate on what you can control and do before a tournament. You can’t understand how every model in the game works and has synergies with others, but you can know your own army, the rules of the game, the format of the tournament, etc. These steps try to mention the key things you can do before a tournament.